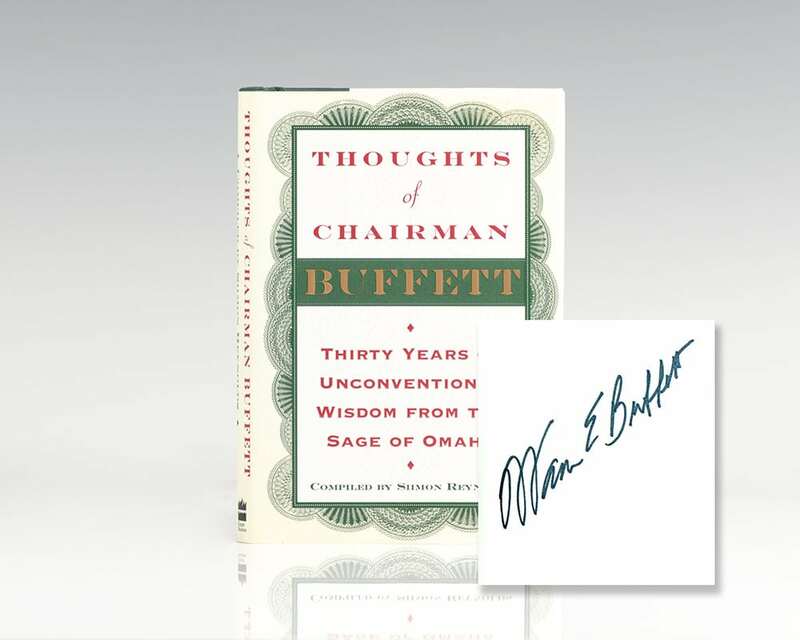 Thoughts of Chairman Buffett: Thirty Years of Unconventional Wisdom from the Sage of Omaha. Reynolds, Simon. (Warren E. Buffett). New York: Harper Business, 1998. First edition of this compilation of quotations by the world’s most famous and successful investor. Small octavo, original half cloth. Boldly signed by Warren Buffett on the front free endpaper. Fine in a fine dust jacket. "Inside this little book is thirty years of vintage Buffett: the lessons he's learned; the mistakes he's made; his observations about people, life, business, and, of course, making a buck. If you ever wanted to learn from a money master but couldn't stomach those long-winded finance books, Thoughts of a Chairman is for you" - from the Introduction.